Sticky-backed holders keep your materials at hand. Self-adhesive poly holders stick wherever they are needed. Clear, heavyweight holders with non-rip seams attach to any dry, clean, flat surface. 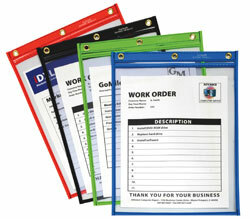 Ideal for convenient storage of instructions or service records on office equipment. Unlimited uses for these adaptable products. 8 1/2 x 11. 50/BX. Learn about the wide variety of shop ticket holders at C-Line..